Every time I talk to someone I haven't seen in a few days, the first question I'm asked is, "Do you have the chickens yet?" Apparently, half of Indianapolis is invested in my search for chickens. The good news is that I have tracked down a farmer (Code name: Chicken Man) who confirmed he would sell me Rhode Island Reds of the right age. The bad news is that he hasn't answered his phone for a week and a half. Either he's found a chicken-sitter and gone on vacation, or, more likely, he's neck-deep in county fair stuff and is ignoring all calls. Either way, I'm frustrated. 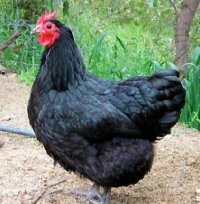 I need chickens. I have the most unbelievable chicken coop in America and NO CHICKENS. Those of you who have been following the blog know that my dad and his BFF (Mr. Dan and Mr. Roy, respectively) offered to build me a coop. The result–well, it kind of defies description. So I present to you, "The Chicken Palace: A Pictorial Essay." The run is the outdoor element of the coop. It allows the birds access to fresh air and sunlight while keeping them safe from predators. 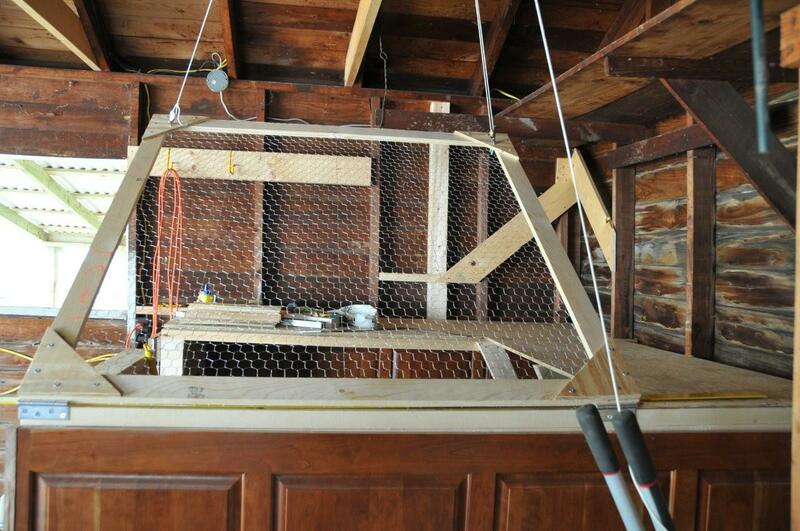 And in this case, it's the fanciest damn bird cage you've ever seen. Why yes, that is constructed from 4×4 set into poured concrete. And yes, the hardware cloth is buried a foot below the ground to keep digging raccoons and the like out. But hardware cloth is pricey, so the top half is covered in 2"x3" metal mesh. The roof is translucent plastic; it will keep the rain off the birds and their bedding. I was planning to use an old screen door, but Misters Dan and Roy were convinced their creation needed a custom-made portal. So they created one that has the same half-and-half construction. It could take a hit from an enraged bull. I had very little to do with the construction of the run, except for minor toadying duties. I did paint the sign, though. The little door is called a pop-hole. 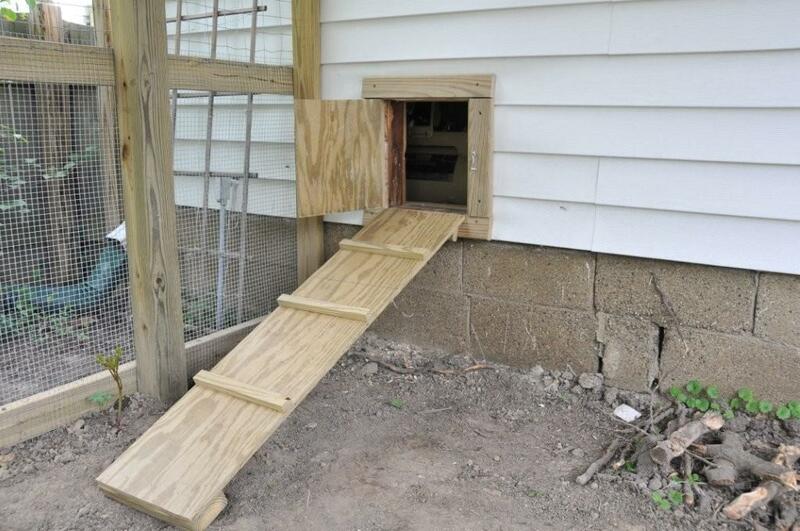 Dan and Roy custom made this ramp so the birds can get in and out eaily. I was going to recycle the climbing wall from the triplets' playset as the ramp, but this one is better. So instead, I set the climbing wall in the run for the chicken exercise. You can see it in the first picture. Why yes, I do believe that these chickens might be the only ones in the country with their own climbing wall. Before, I had to go around to the automatic garage door to get in. Now I can go straight in from the back yard. This is a recycled door, and I'm planning to paint it the same blue-green as the potting bench. The trim will be cream. Why yes, Dan and Roy built the steps too. Once you enter the garage, you are greeted by the glory that is is the henhouse. Dan and Roy have a friend who buys and flips buildings. 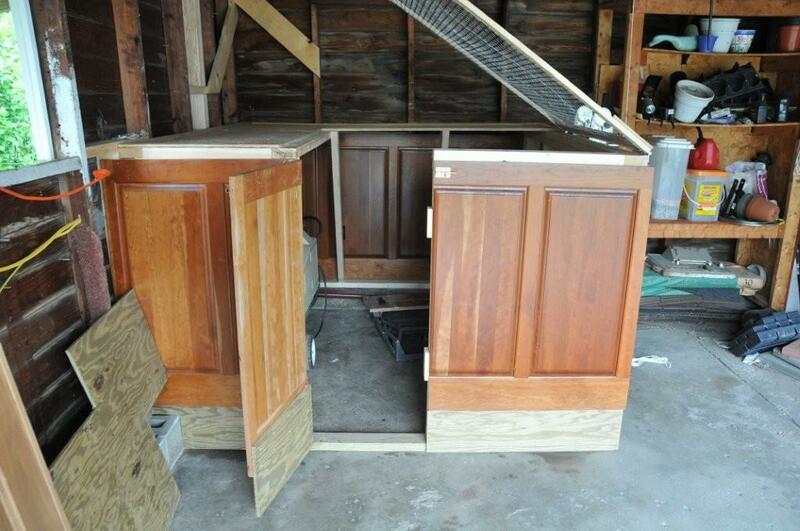 He offered them anything they wanted from his latest acquisition, so they snagged a bunch of materials–which is why I now have what is likely the only henhouse anywhere made of cherry wainscoting. These are some lucky freaking birds. 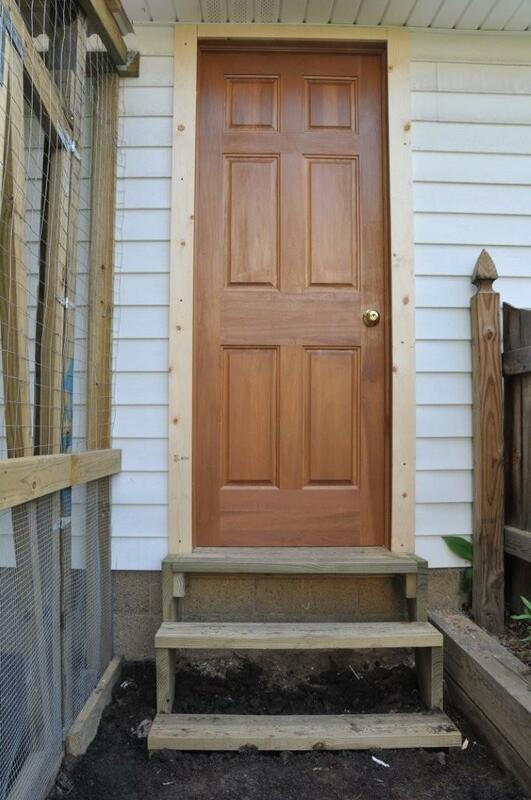 In fact, this henhouse so classy that the door is actually hidden. It swings outward to let me into the house for cleaning. My neighbor asked me when I was going to open the nightclub, seeing as I already had the bar built. You may have noticed that the henhouse is pretty short. There's this frame on top that keeps the birds in. 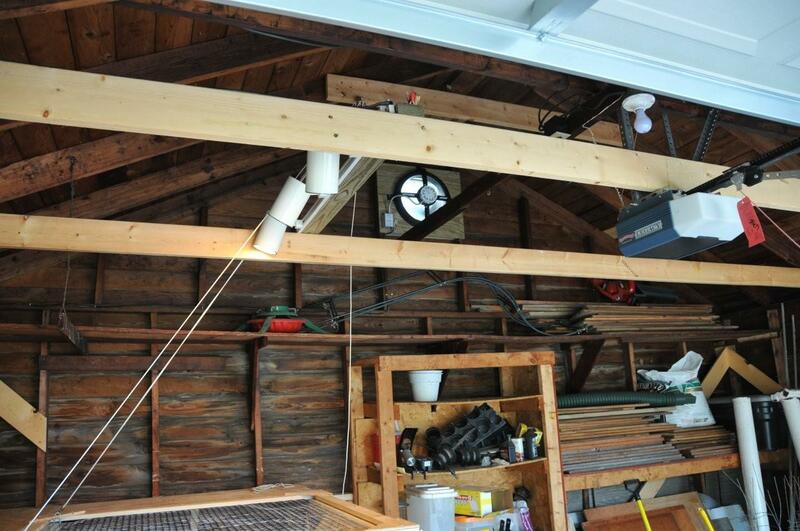 When I need to get in, I pull on a cord attached to a pulley on a rafter beam (no, really) and the lid rises. I clip it to a ring to hold it in place. Seriously. I wonder if Dan and Roy were inspired by Rube Goldberg. 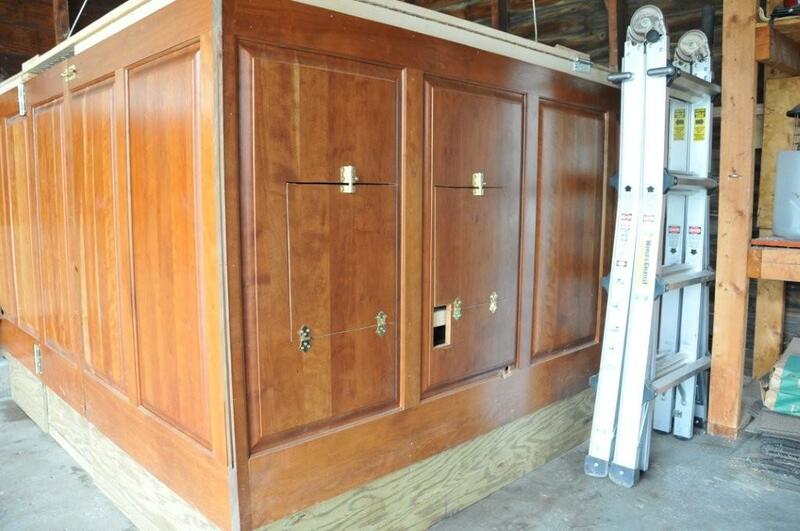 Here you see the outside doors to the nest boxes (hidden, naturally). To collect eggs, I drop the doors open and reach in. I don't have to walk through the coop. Are they good or what? Here you see Dan risking his neck to install a vent fan in the garage. Without airflow, we'd be looking at some broiled chickens. So this attic fan kicks on whenever the temps get about 80 degrees. One of the windows has been replaced by a hardware-cloth-covered screen for the summer to permit the breeze in. With the vent fan installed, the last task was lighting. Track lighting, also salvaged from Dan and Roy's friend. My chickens will have track lighting. CAS thinks we should name them all "Steve" in honor of Steel Magnolias. So as you can see, the coop is ready for its occupants, if the farmer would just call me back. 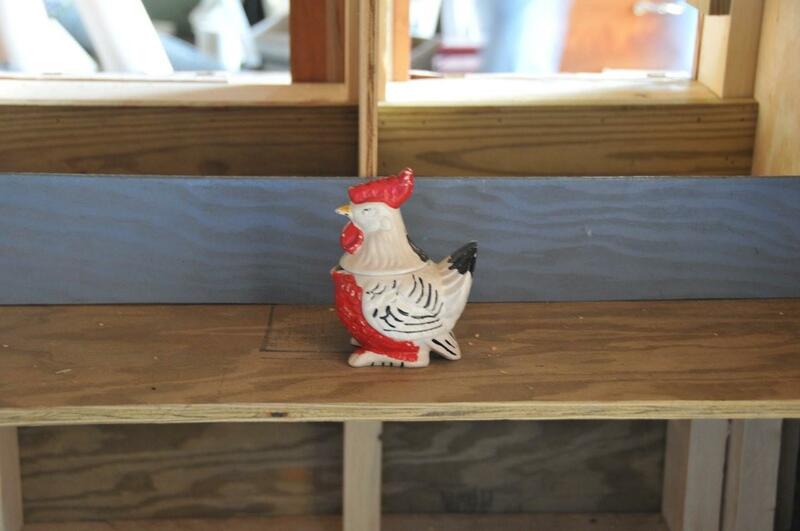 In the meantime, the only resident of the Chicken Palace is this guy, donated by yet another friend of Dan and Roy's. Thank you, thank you, thank you to Dan and Roy. Once the girls start laying, it's all the cream pies you can eat! 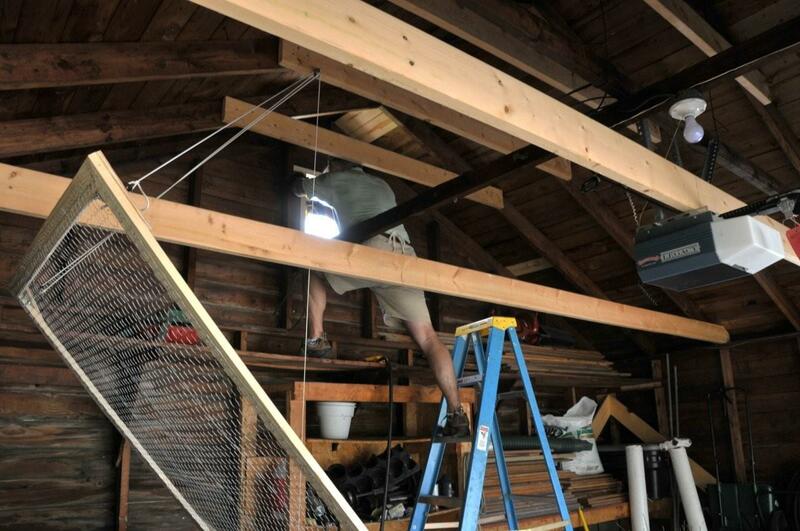 it's a steamy Saturday here at the Fraudulent Farmstead, and as we speak Dan and Mr. Roy are outside working on the run section of the Chicken Palace. I truly can't call it anything else, as the run alone is about 8' x 10', made of treated 4x4s sunk into concrete and corrugated roofing. Or as my boss Terry said upon viewing it, "Damn, Amy, I think that's better built than most of the garages in Irvington." I spent part of yesterday afternoon digging a trench around the run so that we can sink hardware cloth down about a foot to prevent raccoons and other undesirables from digging their way into the coop. Today, the crew is attaching the hardware cloth to the top half of the run and 2" x 3" fencing to the top (that hardware cloth is expensive stuff), then installing a pedestrian door into the garage so that I will be able to tend the girls without having to use the automatic garage door opener. It promises to be an interesting day. Updates as they occur! I have been possessed by a demented poultry breeder. At least, that's the only reason I can think of that my thoughts are occupied 75% of the time with chicken-related research and speculating. I've been wanting chickens in a casual sort of way for a few years, but this year I'm very, very serious. Or at least as serious as I can be when talking about converting a detached garage into a combination hen house and potting shed, with room to park the car as a definite afterthought. 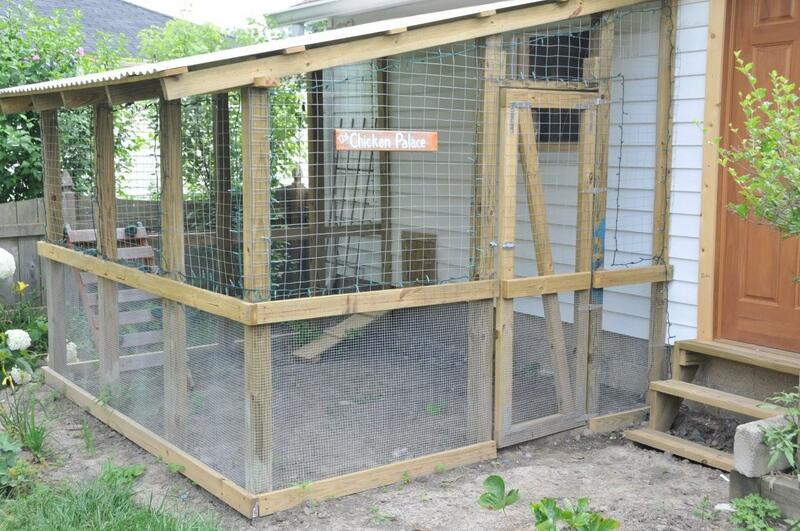 Backyard Chickens, an unholy temple to the Gallus gallus. If you want to know anything about chickens, I guarantee the denizens there will have the answer. Many, many answers, as a matter of fact. In the last few days, I've learned about the deep litter method, the use of apple cider vinegar in chicken drinking water, and difference between grit and oyster shells. I have also spent some time perusing the various coop set-ups. Various models for my garage hen house. Two fab examples are here and here. I especially love the chicken run that wraps around SeaChick's garage. Dan is amenable to insane projects. 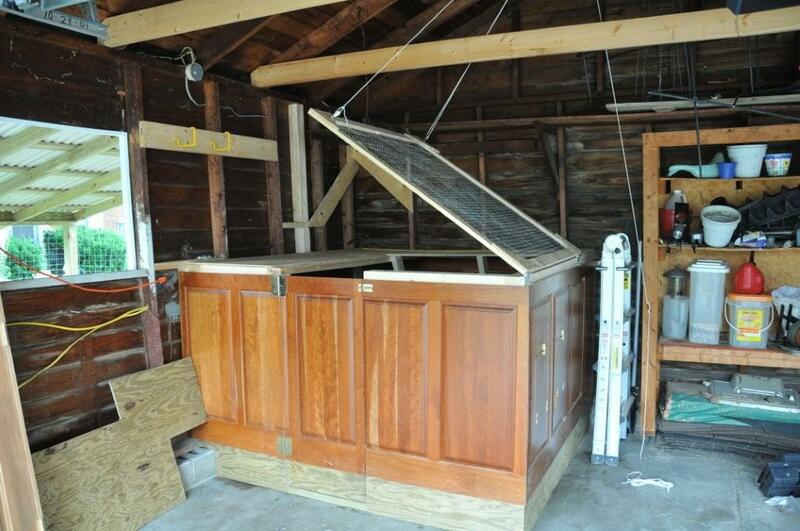 My stepfather very kindly offered his help in designing and constructing my coop and run. He even volunteered his best friend's help. We will also be installing a pedestrian door to the garage, so I can get in and out without having to walk outside the fence and use the garage door opener. It's hard to do an accurate measuring of potential run space if you can't feel your fingers. I took the tape measure out today; but it's about twenty degrees, so my results might best be described as fast and sloppy. A rework of the butterfly border is in order, as it is located on the site the run will occupy. That means good-bye to two caryopteris shrubs (one was looking awfully peaked this summer anyway). Also, the the run is going to sit over the spot where two peony shrubs are now, so I've got to move them or lose them. Chickens destroy any greenery they can get their beaks around, which leads to such genius ideas as this: the chicken moat. This guy fenced his vegetable garden with two parallel fences; the chickens patrol between the fences, eating all the grass that might try to encroach on the garden and any bugs dumb enough to head for the veggies. I'm going to be a lot busier this winter than I thought. Not only do I need to redo the basement bathroom for my sister (I have contractors coming this week for estimates) and put in a new kitchen floor (I should have an estimate by tomorrow), but there's a lot of work to do before welcoming the ladies. Come spring, it's omelets all around!